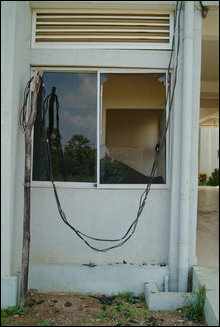 Two Sri Lanka Army (SLA) fired artillery shells landed within the compound of Ki'linochchi General Hospital at 7:30 p.m. on Christmas day damaging three hospital buildings and narrowly missing several hospital staff, including Medical Superintendent of Ki'linochchi, Dr Sathiyamoorthy, sources in Kilinochchi said. 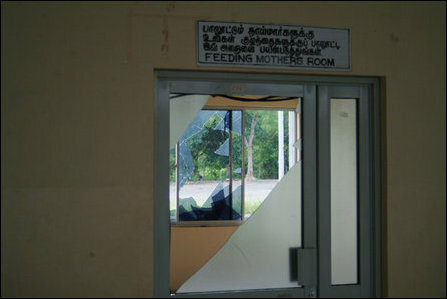 Glass panes of the New-born nursing section for mothers, Outpatients Department, and the Hospital Reception building were damaged in the attack, according to hospital sources. 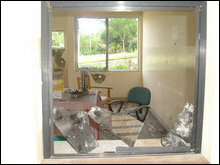 Glass panes of the New-born nursing section for mothers was damaged in SLA shelling on Christmas day. Hospital officials said despite repeated requests through the locally present International Red Cross officials SLA has been violating international norms in targeting hospital serving the critical needs of war affected people. Shells fired by SLA in the last two days have further caused damages to educational establishments located along A9 including Ki'linochchi Technical College, and the Ki'linochchi District Educational Secretariat buildings. 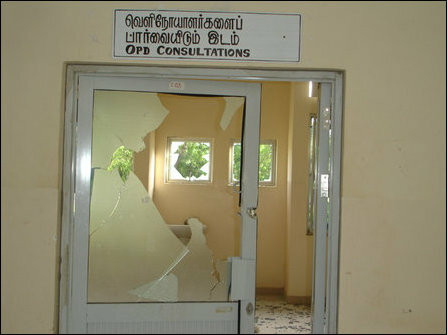 Mullaiththeevu hospital was also came under SLA fire on three days last week 15th, 19th, and 20th which injured two patients and two medical staff in addition to causing damages to hospital buildings. Article 18 of the Fourth Geneva Convention states that the civilian hospitals organized to give care to the wounded and sick, the infirm and maternity cases, may in no circumstances be the object of attack, but shall at all times be respected and protected by the Parties to the conflict. Sri Lanka (Ceylon) is a signatory to the First, Second and Third Geneva Conventions and it ratified the Fourth Geneva Convention of 1949, by accession to it, on 23.02.1959. Ki'linochchi hospital buidling after SLA shelling on on Christmas day. 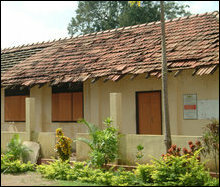 21.12.08 SLA steps up attacks on hospitals in Vanni, disreg..
19.12.08 Sri Lanka attacks hospital, settlements in Vanni, children a..
17.12.08 SLAF bombs refugee settlements: 2 killed, 13 wounded, 4 chil..